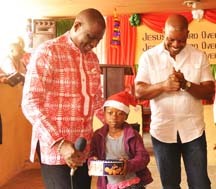 (L-R): Director, Corporate Communications & CSR, Airtel Nigeria, Emeka Oparah; Director, Arrow of God Orphanage, David Ogo-Tsegah; Managing Director and Chief Executive Officer, Airtel Nigeria, Segun Ogunsanya with kids of the orphanage during the visit of Airtel employees and donation to the home at Ajah, Lagos, Tuesday. 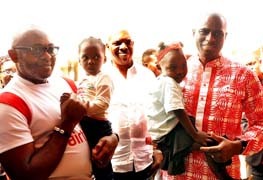 Managing Director and Chief Executive Officer, Airtel Nigeria, Segun Ogunsanya; kid of Arrow of God Orphanage, Chioma Emmanuel with Director of the orphanage, David Ogo-Tsegah during the visit of Airtel employees to the home at Ajah, Lagos on Tuesday. 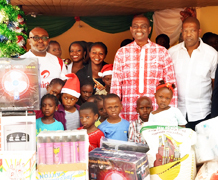 In the spirit of yuletide season, employees of leading telecoms operator, Airtel Nigeria, has showered gifts on kids of Arrow of God Orphanage as part of their 5 Days of Love CSR activities. The team, led by the company’s Managing Director and Chief Executive Officer, Mr. Segun Ogunsanya, donated food items such as bags of rice, beans, tubers of yam, personal care goods and other necessities to the children. (L-R): Director, Corporate Communications & CSR, Airtel, Emeka Oparah; Managing Director and Chief Executive Officer, Airtel, Segun Ogunsanya and Director, , Arrow of God Orphanage, David Ogo-Tsegah during the presentation of gifts to kids of the orphanage at Ajah, Lagos on Tuesday.